City Underground & Eastern Suburbs Line Tunnels, Viaducts and Portals, Harbour Bridge, North Sydney to Waverton and Olympic Park Loop Line. In November 2011 Rapid Construction Pty Ltd was awarded the Fire & Life Safety Assets Cleaning and Maintenance Contract for the first time. 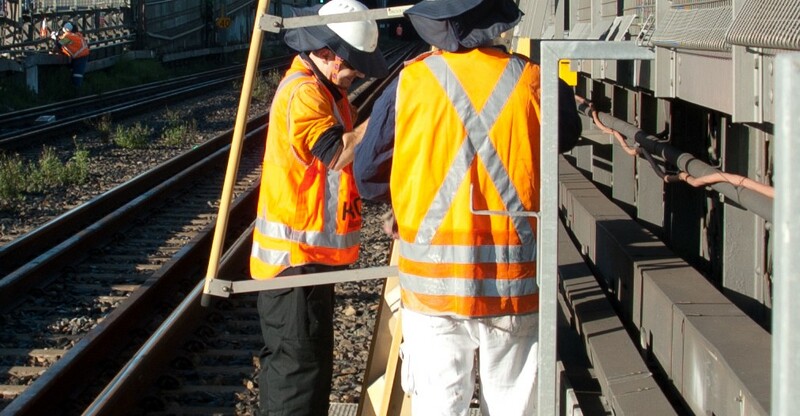 The contract covered full cleaning, preventive maintenance and repairs to all fire and life safety assets in the City Underground and Eastern Suburbs Railways, extending north across the Harbour Bridge to North Sydney and Waverton stations, south through to Erskineville and also including the Olympic Park loop line. We completed this contract in March 2012, with the work being awarded to us a second time in April 2013. Three hundred and forty three train-to-track ladders were cleaned, alongside 343 track platforms and 51 track-to-platform ladders, and track to bike path ladders on the Harbour Bridge, with additional items cleaned and maintained including safe place refuges, phones, through bars, hand holds, orange/blue/white indicator lights, exit signs, instructional signs, sign lights and phone signs. Our team addtionally provided a rubbish picking service with in excess of 12500 litres of rubbish collected during the 2013 contract alone. All works were completed during week night track possessions, commencing after 9pm and finishing around 3am. We deployed qualified tradespeople on all work and offered and delivered additional running repairs during the work, for example to broken and failing pedestrian track crossings in the tunnel system.